Consider this a Girls' Day Out! Come and sew on Friday nights and Finish those projects! A new approach to Beginning Sewing! 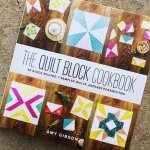 Work through the "Quilt Block Cookbook" and learn new techniques to take your skill to the next level. You won't believe what you are able to accomplish with just a few simple patterns. Start your journey here! Indulge your bag addiction! The Take a Stand tote is a great stand up bag, using several unique bag making techniques. The only needles that come with this cactus are sewing needles! Paradise Club is free club with no requirements other than curiosity. What is everybody else working on? What's new in the store? What are the upcoming classes? You can bring your sharing, bring your embroidery and sewing victories (and defeats) but most of all just bring yourself and be prepared for a great time! Potholders, Placemats and Table Runners! Learn the ins and outs of Premier+2 Software. 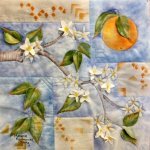 This quilt can be made with fabric for any season. Bust that stash in a flash and get to the fun part - SEWING! Sew through this cheery row quilt and grow your quilting skills! 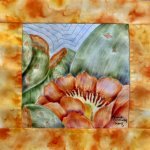 You can smell that orange blossom fragrance with this three-dimensional painting! Did you know you can cut out shapes with your Cameo cutter? Make Your own beautiful sewing machine quilt! A new two-day event with a sewing and garden theme! The Poway Nighttime Group meets at Paradise Sewing. Gingerbread Village is hot out of the oven featuring seven delightful Gingerbread theme house blocks, a peppermint stripe and a scallop border as the icing on the top. This class is designed for the owners of the Floriani software (formerly known as FTC Suite and FTC Pro) to finally once and for all, find out what’s happened?!! Open to all hand applique enthusiasts! Bring your hand applique project to work on. Spending stitching time with others makes the stitching time fly by! Join Jan Krentz, Jerre Mayer and Jan LaGrone and learn to make this very popular, historic X-Plus block. We're staying home in our sewing rooms today! Bring the seashore to your tabletop! Make a simple, breezy top with Embrace double gauze! The colors of this beautiful tropical flower are captured perfectly! Starting out with the basics, beginners learn this easy freezer paper applique method with great results. After the blocks are prepared they can be hand or machine appliqued - hand applique will be demonstrated in class. Make a butterfly block that can be incorporated into a wall hanging, pillow, tote bag or a placemat. Make more butterflies and the options are endless. Come with a friend for even more fun! I'm Sew Glad I Came DAY! Are you ready to rev up your creative spirit? Are you itching for something new to inspire you? Are your fingers ready for a new touchable experience? Join us for a hands-on do-it-yourself I've never tried that before fabulously fun What will they come up with next? I can do that on a sewing machine? I'm sew glad I came Day! Current Owners of Pfaff Creative Machines see class on February 7, 2017. I'm So Glad I'm an Owner Day! In-depth training on techniques combined with creativity.